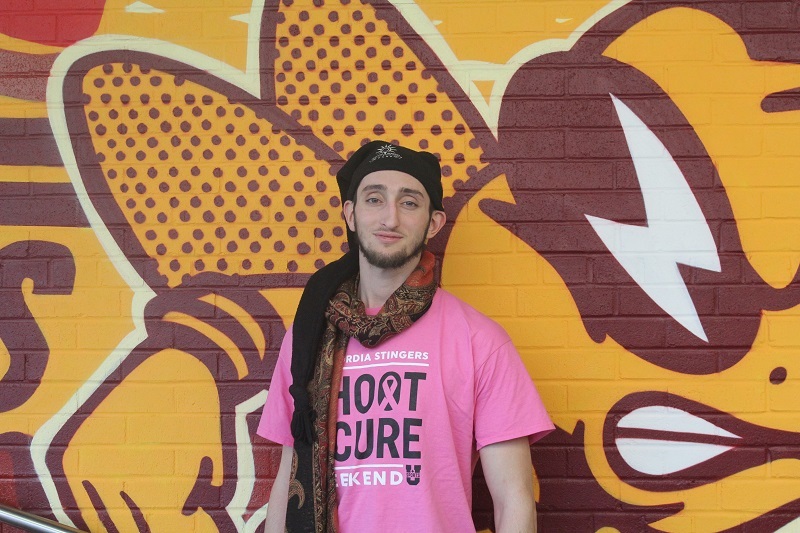 The Concordia Stingers men’s basketball team have their very own Energizer bunny by the name of Dvir Cahana. Anyone who has attended a Stingers basketball game in the last three seasons has probably noticed Cahana hooting and hollering from the bench to pump up the team. Off the court, Cahana maintains that high level of energy. It isn’t out of the ordinary to find him freestyle rapping, dancing or singing around campus whenever he can. It doesn’t take long for him to bring smiles to peoples’ faces. Born in Göteborg, Sweden, Cahana and his family moved to Canada when he was only five years old. His father is a rabbi, and one of the first jobs his dad was offered was at a synagogue in Montreal. It was here that Cahana fell in love with the game of basketball. During his early years, Cahana was always known as “the tall kid.” He used his height to his advantage and started playing basketball to make new friends. With his basketball career coming to an end, Cahana wants to become a rabbi. Photo by Alex Hutchins. Cahana played forward for his high school team, Hebrew Academy, in Côte St-Luc, and when he wasn’t playing for them, he played in several summer leagues. It was at this point when he started to take basketball more seriously. “The school league is solid, but when I would play in the summer, the top players would be murmuring on the side, ‘You should play the inter-city divisions because there’s stronger competition,’” he said. Cahana took their advice and joined the inter-city division for the Young Men’s and Young Women’s Hebrew Association (YM-YWHA). His decision was met with uncertainty from his family as it led to more challenges than just tougher competition. In CEGEP, when he played for the Dawson Blues, Cahana had to walk to far places. Although this would seem like a daunting task for most people, Cahana said he believes it was a valuable experience in his life. “It was important for me to figure out how to make sacrifices without impeding on my ethical compass or religious commitments,” he said. Clearly committed to both basketball and his religion, Cahana worked exceptionally hard to earn a spot on the Concordia men’s team before the 2015-16 season. A six-foot-three forward, Cahana said he admires NBA players like Matthew Dellavedova, who plays for the Milwaukee Bucks. Dellavedova is someone who isn’t necessarily the most skilled player on the court, but he brings grit, toughness and earns every opportunity he gets. Similarly, Cahana works hard for his opportunities. Whether it’s waking up at 5:30 a.m. to walk to practice, or spending six hours alone in the gym developing his three-point shooting ability, he is always trying to get better. Even more impressive, his presence is still felt when he’s not playing. The ultimate energizer, Cahana takes tremendous pride in supporting his teammates. Cahana was rewarded for all of his hard work in the team’s final game of the regular season, which was his final game with the Stingers. On Feb. 24, he played 27 minutes, the most of his three-year Stingers career in a 71-59 victory over the Université Laval Rouge et Or. Following the game, he received a lot of positive feedback from teammates and fans. Cahana said he hopes he can continue to impact others in the foreseeable future. The third-year student is graduating with a major in political science. His goal is to follow in his father’s footsteps and become a rabbi himself. “The role of a rabbi is a mixture of a parent and a political leader who guides the community. The suffix of that sentence is always ‘for the community,’” he said. With a clear passion for inspiring others, Cahana seems more than ready to pursue the next chapter of his life.